Washington has revoked the visa of the Venezuelan ambassador to the US, the US state department has said. Venezuelan President Hugo Chavez had been angered by comments Mr Palmer made about the country this year, and withdrew his approval of Mr Palmer. The US move in effect expels Venezuelan envoy Bernardo Alvarez Herrera. It is not thought Mr Herrera is currently in the US, but the revocation means he cannot return. State department spokesman Mark Toner said Caracas had only itself to blame. "We said there would be consequences when the Venezuelan government rescinded agreement regarding our nominee, Larry Palmer. We have taken appropriate, proportional and reciprocal action," he said in an emailed statement. 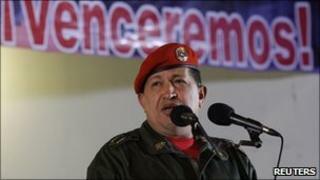 News of the revocation had been carried earlier on Venezuelan sources. "They will do what they want, but that man is not coming here as ambassador. Anyone who comes here as an ambassador has to show respect. This is a country that must be respected." Earlier this year, Mr Palmer said morale was low in the Venezuelan armed forces, and expressed concern that Colombian Farc rebels had been sheltering on Venezuelan soil. "Despite extensive financing, professionalism in the Venezuelan army has decreased due to the retirement of large numbers of officers and a President Hugo Chavez move allowing non-commissioned officers to transition directly into the commissioned corps," he said in answer to questions from the US Senate Foreign Relations Committee in July. "New officer training has been cut from five to four years. Most significantly, there has been a noted preference for political loyalty over professional talent. Morale is reported to be considerably low, particularly due to politically-oriented appointments." On the ties with Colombian Farc rebels, he said: "I am keenly aware of the clear ties between members of the Venezuelan government and Colombian guerrillas. "The Revolutionary Armed Forces of Colombia (Farc) maintain camps in Venezuela, and members of the Farc high command have occasionally appeared in public in Caracas. The Venezuelan government has been unwilling to prevent Colombian guerrillas from entering and establishing camps in Venezuelan territory." It is unclear how the latest escalation will affect the two countries' tempestuous relationship, says the BBC's Iain Mackenzie in Washington. The situation had shown signs of improving with the election of Barack Obama, he says; however, President Chavez later declared him to be "a great disappointment" and claimed he had "the same stench as George W Bush". Venezuela is a major oil producer and, despite its political differences with Washington, remains the fifth biggest crude supplier to the US. Mr Palmer's appointment, which was made in June, has yet to be confirmed by the US Senate.